The Magazine is putting together a users' history of modern Britain, to coincide with Andrew Marr's television programme A History of Modern Britain on BBC Two. Over the next few weeks, the Magazine will be looking at each decade in turn, using extracts from Andrew Marr's book, a History of Modern Britain, and clips from his television series of the same name. But just as important to this story are your memories of these 50 years. We want to put together an alternative history of post-war Britain. We're now looking at the 60s, the decade of the Beatles, the Post Office Tower and the UK's first shopping centres. 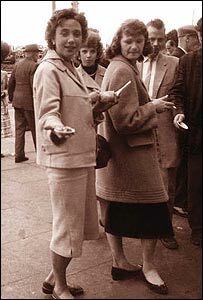 "Rationing had been in place since the war, people came to accept it for years afterwards. In 1947, if you saw a queue you got on the end of it. Restrictions on staple items like sugar, meat and clothing were lifted at different times and by the early 1950s some things were quite widely available. I remember my mother haggling with the butcher over what type of meat she could get with her coupons. But when sweets became available in 1952, there was such a rush to the kiosk at London Bridge, near where I worked, that it quickly ran out and had to shut down. 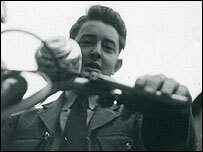 And on national service, he says: "When I reported to RAF Cardington in Bedford, I found the only thing most of us had in common was that we were nearly all born on the same day. People were called up by age. That is how the system worked. The first eight weeks was spent square bashing, designed to turn you from a civilian into a serviceman. Painting coal white was one of the more outlandish things you were told to do, seemingly without any purpose except getting you to obey orders." "When I was born there were trolleybuses everywhere. Meat was still on ration. There were bomb sites and prefabs, policemen with striped duty armbands, proper junk shops, Woolworths had pneumatic money cans, two sweets cost a halfpenny, some cigarettes came in fives and some were sold loose. "Christmas decorations were coloured paper strips glued together, there were fly-papers hanging from the ceiling and bath night was once a week in a tin bath. I remember Dan Dare, Radio Luxembourg, Welgar Shredded Wheat, bread and drippin' for tea, sixpenny bits in the Christmas pudding, half-crowns, florins and 10-bob notes." 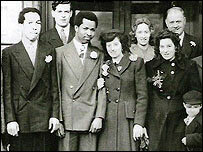 George and Dorothy Leigh met on the dance floor at the Realto Ballroom in Long Eaton. "She fell over," says George. "I picked her up, and we've been together ever since." 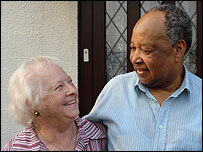 George had arrived from Jamaica during the Second World War to serve in the RAF. On the cusp of the new decade of the 1950s, he and Dorothy began their married life. Their wedding was memorable. "When we went into the registry office, there was no one about," remembers Dorothy, who recalls her experience more fully in a BBC Radio 4 programme next week - Sleeping with the Enemy. "But the word obviously got out that a couple had gone in - one black, one white." "When we came out there were about 200 people waiting for us, all staring," adds George. "I was nervous. I saw all these people, and I thought what are they going to do? Are they going to lynch me?" So many people gathered to watch George and Dorothy emerge from their wedding, that the police had to move people on. A local newspaper photographer also got wind of something unusual going on at the registry office. He took this photo (above) of George, Dorothy and their guests - the only picture the couple have of their happy day. "We made Coronation things in my infant school class. There must have been a certain amount of overkill as I remember our teacher holding up a Scotts porridge oats packet and saying, 'What shall we make out of this?' 'The Coronation coach,' came the reply. 'I'm sick of the Coronation coach,' she said. "Corona fizzy pop was the best thing about the 50s - huge bottles with sort of clip-on tops, it was all sorts of vivid glorious colours (those innocent days before E numbers and hyperactivity) and you got tuppence back on the bottle. I remember a Sunday school picnic at Burnham Beeches where we were given a whole bottle each." "I went to the Festival of Britain as a young child but really only remember the funfair rides such as the Big Dipper, the Rotor and the Waterchute. Apparently there was a hypnotism show where members of the audience were hypnotised. Although I did not go on stage I became hypnotised and had to be dehypnotised after the show was finished. "I remember vividly the London smog, travelling to school and back by 521 trolley bus and then covering my mouth with a scarf when I got off of the trolley bus. You would wait an hour or two for a trolley bus and then they would come bunched up together. I think I counted nearly 20 once. Apparently one night the smog was so bad that my Dad had to walk in front of the trolley bus all the way from Bounds Green up to Friern Barnet Hospital which was close to where we live." "On 2 June, 1953, I was one of three million people lining the route of the Coronation. I was in Parliament Square. As a small, young-looking, spotty 13-year-old, I was one of the spectators allowed by the police to sit on the pavement in front of the adults. So I had a ringside seat. "A special cheer went up, I remember, when Queen Salote of Tonga ignored the weather and, though a very large woman, stood and waved throughout her lengthy ride to the ceremony in Westminster Abbey. Millions watched on their brand new television sets and millions of others - like me - went to a local street party in the evening."